BABIES WERE BORN!!!! 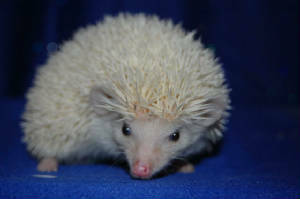 For more info, go to Hedgehogs for Sale. 2010 Wisconsin Entrepreneurship Week Young Entrepreneur of the Year Award Winner. Here is the link to my interview video. Check it out and learn more about me and my hedgehogs. I am excited to announce that I have recently added new females to my breeding herd. Pictures of them will be added shortly. Also new and available (with or without the purchase of a hedgie from Rob's Hedgehog's) is the new CAGE KIT. It comes with everything you'll need, consisting of: a XL cage, running wheel, igloo, food dish, water bottle, litter pan, litter scoop, a single running tube, several toys and 2 weeks worth of food that we feed. After it's all said and done, we will be saving you the headache and about $50-60. Feel free to ask about them as well. Ralphie is the daddy to all our baby hedgies. He is a large and friendly dark eyes white. Maria, Ursula and Cindy Lou are the mothers. Maria is a very friendly dark grey with a beautiful dark mask. Ursula is a sweet tempered light grey snowflake. Cindy Lou is a dark grey pinto with a blaze face. Hedgehogs make great family pets and are great for many people who suffer from allergies! My hedgehogs are bred for good health and temperment, and are guaranteed healthy when they leave my home. Ralphie is the dad to all of my babies. He has the best personality that I've ever seen.